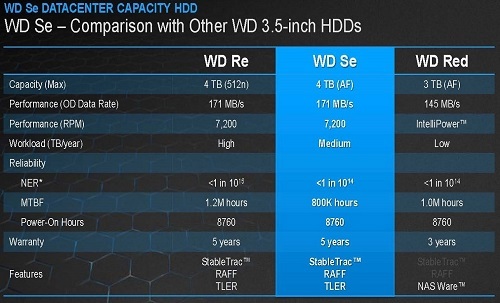 Western Digital is continually trying to identify gaps in the market and tailor a solution that fills those gaps by providing drives that deliver the performance and features that are attractive to that market segment. With the recent release of their new Se series of drives, Western digital is bridging the gap between their enterprise Re series and their NAS WD Red series. Essentially, the new Se series is a low end Enterprise drive that provides similar performance of an Re drive with a lower cost per gigabyte (due to it’s lower workload rating). On paper, this is a perfect solution SOHO/SMB that are looking for higher reliability and performance over desktop drives, but without the enterprise cost that generally comes with the jump from desktop to enterprise class drives. 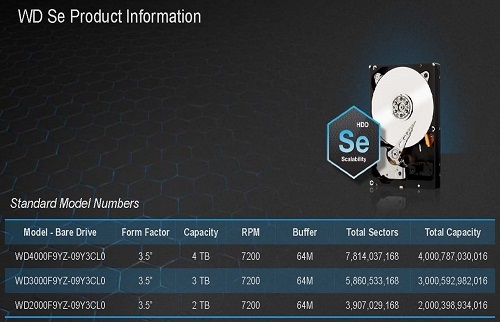 Here is a quick synopsis of what the Se drives provide over desktop class drives. One of the important takeaways I see looking at the list is the inclusion of TLER. TLER (Time Limited Error Reporting) is a hard requirement if you want to use drives in RAID, as this limits the time a drive can go into an error checking state. Without this limit, a drive can prematurely drop out of a RAID set while it’s simply doing internal error checking. 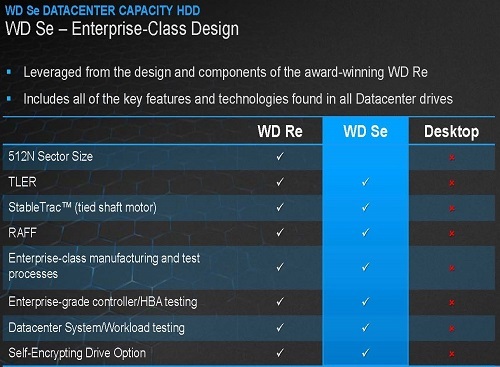 Lastly, this comparison chart breaks down how the Se fits between the Re and Red series of drives from WD. We will look at cost per gigabyte later in the review, but if the cost savings is significant over the Re, it’s clear to see you get a lot more drive over the Red series. Additionally, although not formally listed on the WD site, there are reports that the WD Red series are incapable of being installed in enclosures with more than 5 bays due to vibration causing premature drive failures. It would appear to me that for enclosures with more than 5 bays, the Se series of drives would be the only available solution short of the full Re enterprise class drives.